Do-It-Yourself Carpet Cleaning vs Hiring Fort Wayne Carpet Cleaners? The do-it-yourself craze is everywhere on the internet with websites like Pinterest and Etsy and others. The do-it-yourself projects on those websites are fun and a good challenge but not all home projects are DIY. There are some projects you should hire professionals for including cleaning carpet. Here are reasons to avoid do-it-yourself carpet cleaning in Fort Wayne. You might think carpet cleaning is easy if you watch a professional do it but everything looks easy for professionals at their craft. This includes doctors and lawyers and athletes too. The Fort Wayne carpet cleaners you see in action have years of experience and training and know exactly how to properly care for and clean carpet. To attempt do-it-yourself carpet cleaning means you are responsible for choosing the correct equipment to use or carpet cleaning machines to rent, buying and using the correct solutions and operating the machinery correctly. If any step is performed wrong it could lead to permanent damage to your carpet. The chemicals or solutions themselves must be used in the correct amount and various stains and carpet fibers must be considered. You also need to consider the labor involved since carpet cleaning is very labor-intensive and time consuming too. You might be interested in do-it-yourself carpet cleaning to save money and reduce your homeowner costs but if you do damage the carpet you will regret it and pay more in the long run to buy and install new carpet. Leave do-it-yourself projects to home décor or minor repairs around the home or garage and hire Chem-Dry of Fort Wayne for your carpet cleaning needs. We have years of training and the certification to prove we know how to do the job and how to do it right the first time. Even better, we use green products and low moisture methods healthier for your carpet and your home. 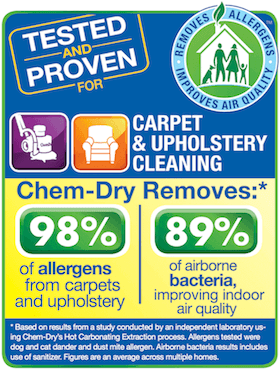 Pass on do-it-yourself carpet cleaning and call (260) 409-1138 to schedule an appointment with Chem-Dry of Fort Wayne.